This series of leaflets and booklets are printed in-house. They provide an opportunity to publish memories of local residents, and other source material, at low cost. We would particularly welcome reminiscences of local commercial and industrial activities. We would also welcome more transcripts of local source material, and also offers from people willing to check draft transcripts. 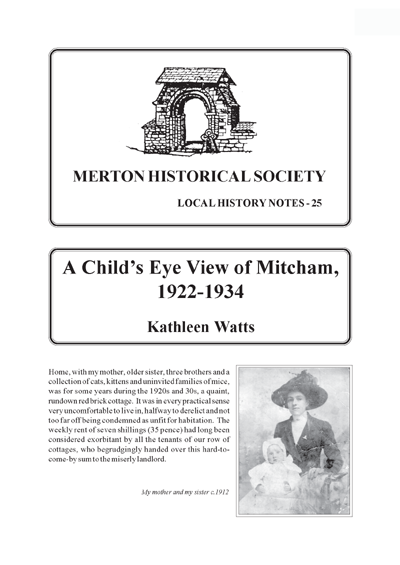 We are very grateful to Kathleen Watts for letting us publish her childhood recollections. Kathleen lived in one of the cottages which formed Berkeley Place, built on what had been Killicks Yard adjoining Berkeley House and Berkeley Cottage in London Road, Mitcham. 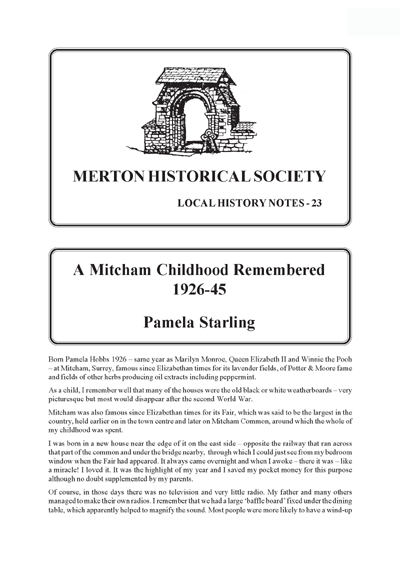 Pamela Starling’s family lived near Mitcham Common. She describes daily life, school and special occasions, as well as wartime dangers and evacuation. Cyril Maidment has collected photographs and views of all the old buildings that stood on the site of the Nelson Hospital and nearby, identifying the viewpoint of each one. Peter Hopkins has gone through the manorial court rolls to trace the history of each holding from the late 15th century to the 19th. Also included are a Vincent Lines article from a 1929 edition of Wimbledon Boro’ News, information from the 1891 and 1901 Censuses and local directories, as well as several maps. Constance Pope was born at 1 Willow Cottages, Mitcham in 1916, and has lived in the same house ever since. Her recollections of life around Manor Road in the 1920s reflect a way of life long gone, but still fresh in her memory. On Thursday 16 May 1833, led by the village band, a party of Mitcham parish officials, accompanied by old men who claimed to remember the boundary marks from their childhood, and boys upon whom reliance would be placed in years to come, walked the boundaries of the parish. By good fortune a detailed account by Edwin Chart of this perambulation, conducted with all due ceremony, has survived (in transcription), and we can still attempt to follow the route taken. Memories of life in and around Mitcham’s Church Road where the Michael Reed’s parents ran a newspaper shop. Those who remember the War years will have very vivid memories of all that happened:- of the sudden changes – the house and family across the road that were not there next morning – the ‘culture shock’ of evacuation, etc., etc. 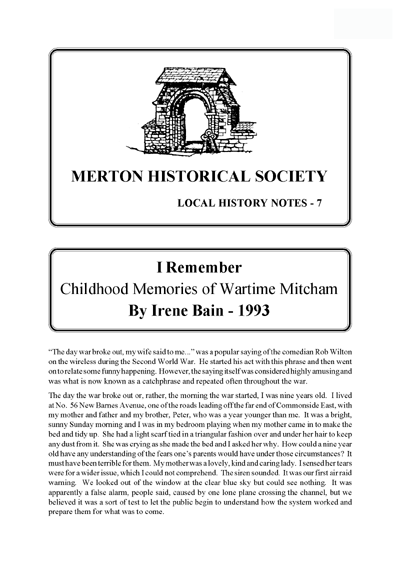 Irene Bain has remembered, vividly, life in Mitcham during the War, as it was for a family. For those who weren’t there, this is what it was like. 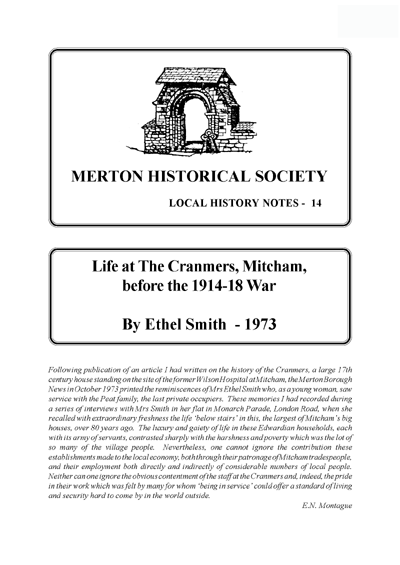 The Cranmers was a large 17th-century house standing on the site of the former Wilson Hospital at Mitcham. Mrs Ethel Smith, as a young woman, saw service with the Peat family, the last private occupiers. These memories were recorded by E N Montague in 1973 during a series of interviews with Mrs Smith in her flat in Monarch Parade, London Road, when she recalled with extraordinary freshness the life ‘below stairs’ in this, the largest of Mitcham’s big houses, over 60 years before. Many of Mitcham’s large houses were occupied as private schools in the 18th and 19th centuries. For most of these we have no knowledge of life and learning. For one of these schools, however, we have a unique account – the sixth Baron Monson’s reminiscences of his schooldays at the Revd Richard Roberts’ Academy, in the house known in recent times as Glebelands. 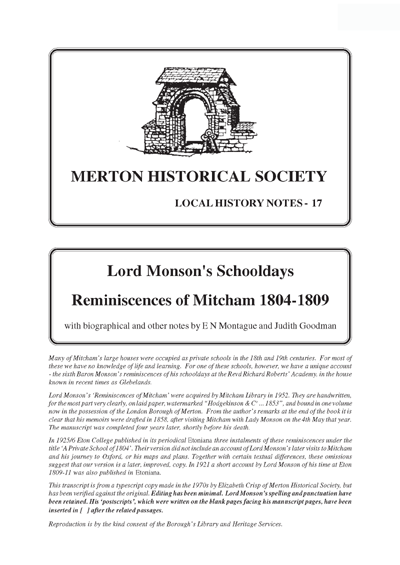 Many of Lord Monson’s Mitcham schoolfellows later became prominent in politics, the church and society. His memoirs give interesting glimpses of some great men when they were boys. 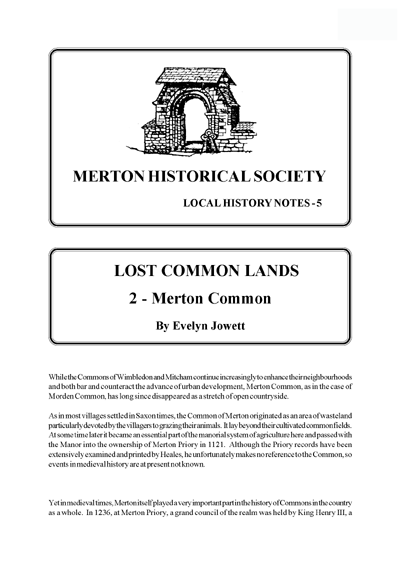 An account of how Merton Common was enclosed by means of a private Act of Parliament in 1816. 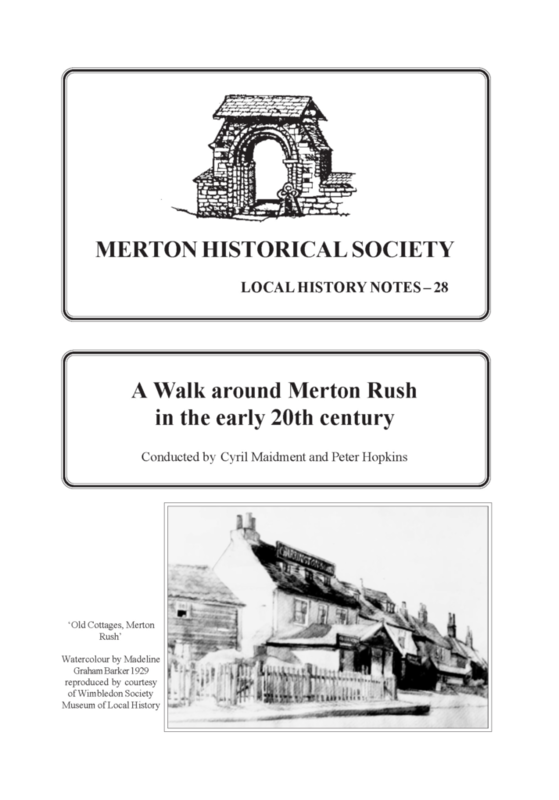 This article first appeared in the Merton Borough News as part of the series ‘The Merton Story’ on 15 and 22 March 1974. Miss E M Jowett , Vice President of the Society, died in August 1990. 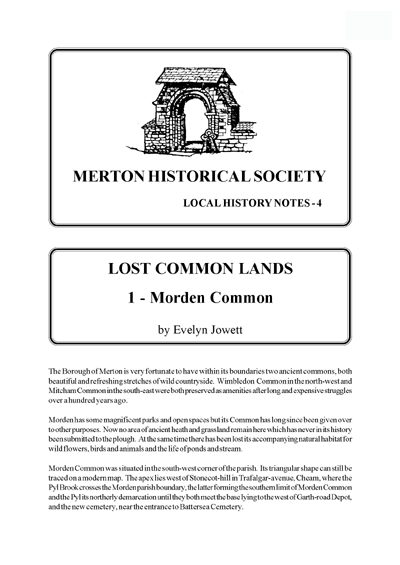 Morden Common, always small, shrank throughout the 19th century. The last open land was lost in the 1920s. This article first appeared in the Merton Borough News as part of the series ‘The Merton Story’ on 8 March 1974. Miss E M Jowett , Vice President of the Society, died in August 1990. John Marsh Pitt produced this Memoir to his mother shortly after her death in 1899, and the Society is grateful to member John Pile for donating a copy of the book for reproduction. ‘This little book, measuring 14.5 by 11 centimetres, is plainly bound in blue cloth, with gilt lettering on the front and the spine, and blue marbled endpapers. It was printed in 1899 by Jesse Worts Ward, printer and publisher of Croydon. We are not told how many copies Ward produced. 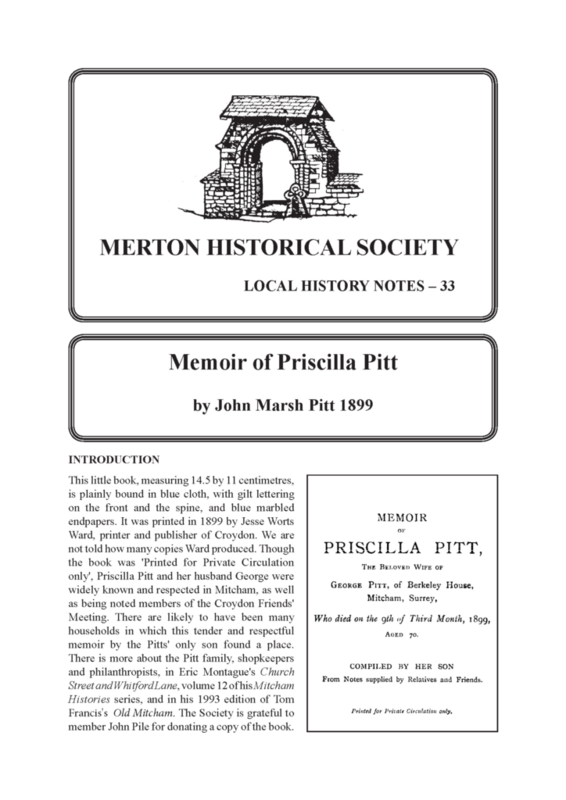 Though the book was ‘Printed for Private Circulation only’, Priscilla Pitt and her husband George were widely known and respected in Mitcham, as well as being noted members of the Croydon Friends’ Meeting. There are likely to have been many households in which this tender and respectful memoir by the Pitts’ only son found a place. 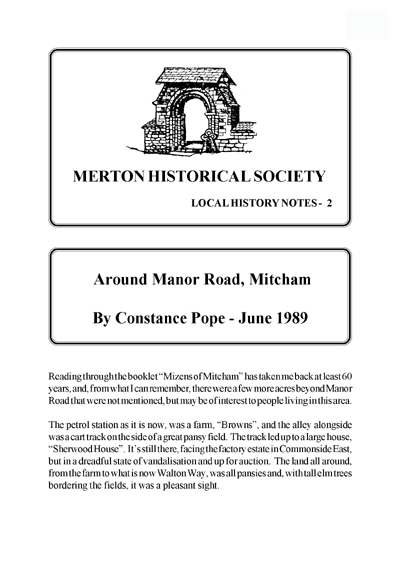 There is more about the Pitt family, shopkeepers and philanthropists, in Eric Montague’s Mitcham Histories 12 Church Street and Whitford Lane, and in his 1993 edition of Tom Francis’s Old Mitcham‘. 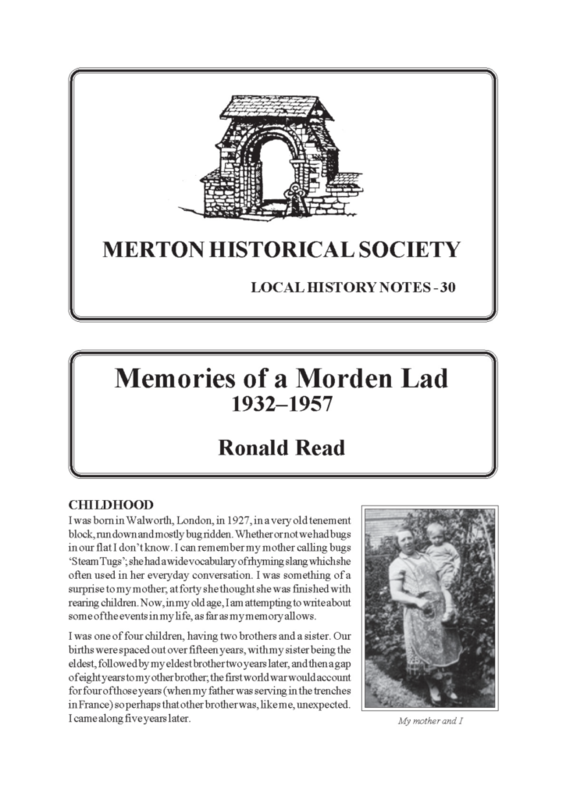 Ronald Read recounts his childhood and wartime memories of growing up on the Morden part of the St Helier estate in the 1930s and 1940s. He then takes us to post-war Europe following his call-up to the army in 1945. His return to civilian life in Morden in 1948 was interrupted by 18 months spent in sanatoria in Waddon, Southbourne and Cheam, after he was diagnosed with TB in 1952. 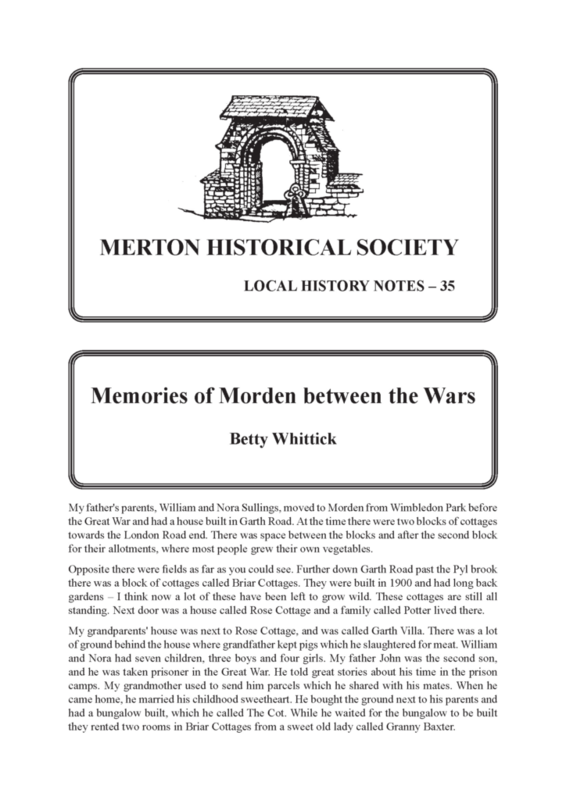 Mr Read expresses himself bluntly, and some readers might be offended by his language, but his account is a valuable, and fascinating, record of his life and experiences at home in Morden and further away. At 72 pages, this is our most substantial Note yet. 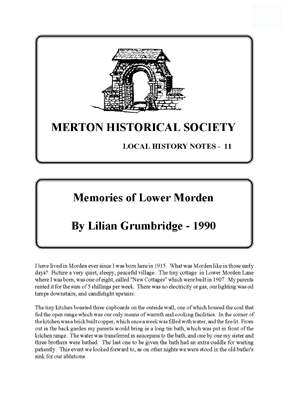 Lilian Grumbridge was born in one of the ‘New Cottages’ in Lower Morden Lane in 1915, and lived there until her marriage, when she moved to her present home in nearby Hillcross Avenue. Her memories of life in this tiny rural area, with its three farms, contrasts with life in the area today. Betty Whittick relives her childhood in Garth Road. Those who heard Betty at our September 2012 ‘Chat Show’, or have listened to snippets on our website, have already had a foretaste of these fascinating reminiscences. We have all laughed at ‘Dad’s Army’, but behind the mishaps and jokes was a very serious purpose. 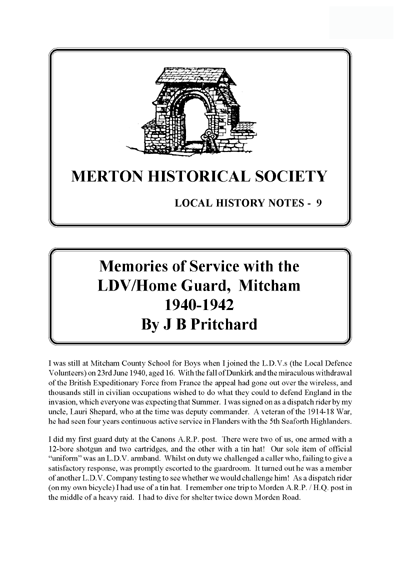 These notes by J B Pritchard give a clear, factual account of the formation, arming and training of the Mitcham Home Guard, formed to protect Mitcham against the threatened German invasion or any other hazard. A timely reminder of desperate measures needed in desperate times. 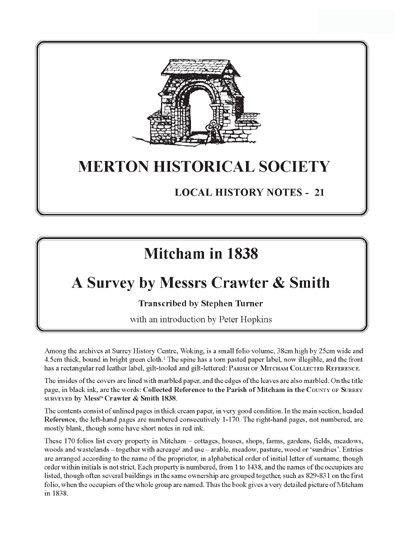 Among the archives at Surrey History Centre, Woking, is a small folio volume entitled Collected Reference to the Parish of Mitcham in the COUNTY OF SURREY SURVEYED by Messrs Crawter & Smith 1838. Its 170 folios list every property in Mitcham – cottages, houses, shops, farms, gardens, fields, meadows, woods and wastelands – together with acreage and use – arable, meadow, pasture, wood or ‘sundries’. Each property is numbered, from 1 to 1438, and the names of the occupiers are listed, though often several buildings in the same ownership are grouped together. 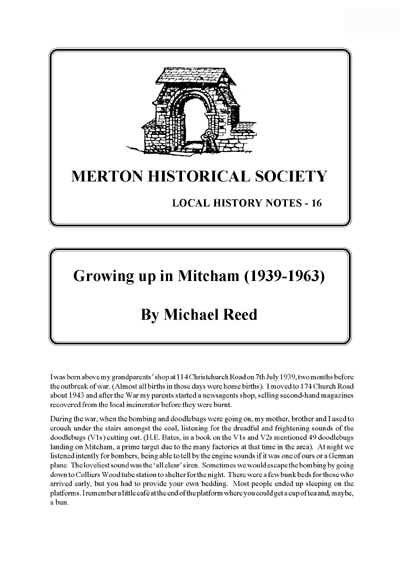 Thus the book gives a very detailed picture of Mitcham in 1838. 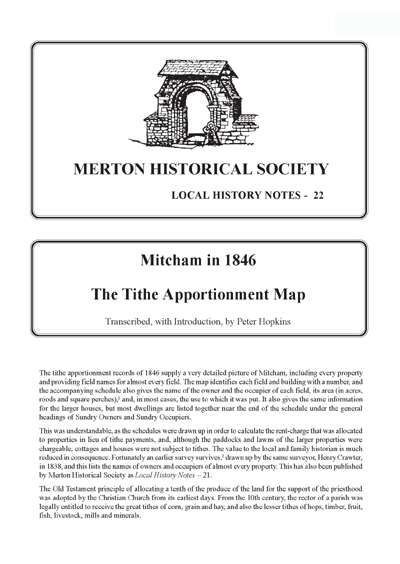 The tithe apportionment records of 1846 supply a very detailed picture of Mitcham, including every property and providing field names for almost every field. The map identifies each field and building with a number, and the accompanying schedule also gives the name of the owner and the occupier of each field, its area (in acres, roods and square perches), and, in most cases, the use to which it was put. It also gives the same information for the larger houses, but most dwellings are listed together near the end of the schedule under the general headings of Sundry Owners and Sundry Occupiers.